Bakers from Village Bakery raise dough for hospice | News by Wales Express News, People Before Profit! A group of big hearted bakers are organising a charity football match to raise some dough for a hospice. VILLAGE BAKERY CHARITY FOOTBALL MATCH IN AID OF NIGHTINGALE HOUSE…. 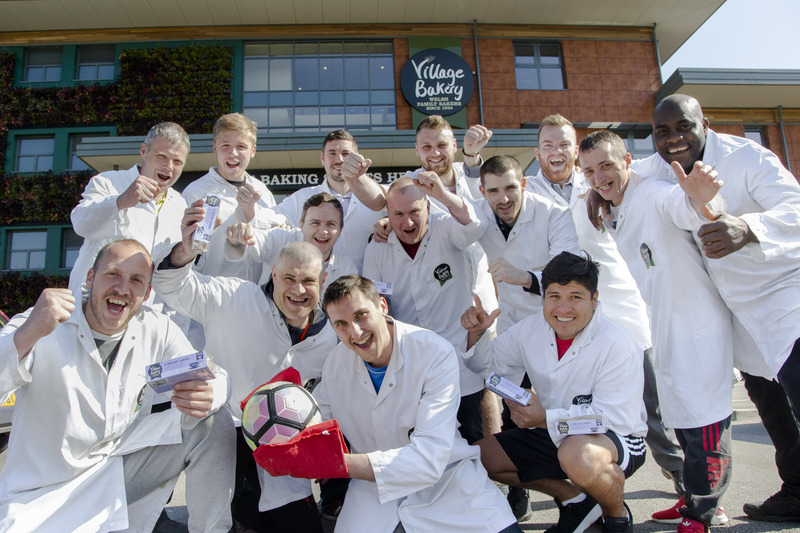 Pictured are Team VB who will be taking part in a charity football match to raise funds for Nightingale House Jerzy Zakrzewski and the rest of the Team from Village Bakery, Wrexham. The team at Village Bakery are in training twice a week for the game in aid of Nightingale House in Wrexham. They will be playing Welsh National League side Johnstown FC at Chester City’s ground, the Deva Stadium, at 6.30pm on May 21. In the meantime, they have a couple of friendly games lined up to get themselves in tip top condition for the big match. It’s being organised by production supervisor Craig Herling, 22, who is also a talented goal-keeper who has played for the likes of Cefn Druids, Maesgwyn, Brymbo and Airbus. For this match he won’t be taking to the pitch but sticking to coaching duties instead. He said: “I just thought it would be a nice touch to link both the football and the charity together and the Village Bakery have been extremely supportive. “Hopefully, we can get as many people as we can down there on the day to get behind the team and support the hospice. “The lads have worked hard in training over the past few weeks so it’s going to be a good match. “We’ve got a few of Welsh National League players so we should give Johnstown a run for their money and we’ll be trying to win the game”. The team will be captained by shift manager Craig Higgins, 31, who’s coming out retirement for the match. Craig, a central midfield general, played for his home village club, Coedpoeth, at all levels from the age of eight until injuries forced him to quit last year. He said: “I finished because I had groin and hamstring injuries but I should be alright for this one I hope. I’ll show some of the youngsters how to run around. Among those rising to the challenge is account manager Tom Kellaway, 25, who will be playing at full back. Tom said: “We’ve all got behind the idea and we’re taking it quite seriously with twice weekly training sessions. “We’re hoping the charity match can become an annual event when we’ll be playing for the Village Bakery Cup. “It’s going to be a lot of fun and we’re aiming to raise as much money as we can for Nightingale House. “The Village Bakery is very much a family-run, community-based company so it’s good to show our support to the hospice which provides such a vital service. The hospice provides specialist palliative care services to patients and their families across a wide area stretching from Wrexham, Flintshire and East Denbighshire to Barmouth and the border towns including Oswestry and Whitchurch. Around 21 per cent of the cost of running the hospice comes from statutory funding – and they have to raise £2.8 million annually just to maintain the same level of service. Village Bakery managing director Robin Jones said: “We have a great bunch of people working here and I am proud of the way they are pulling together to raise money for such a fantastic charity.